Having just completed two years of studying (PGDip Forensic Psychology, the scope of which is really beyond this blog), I have recently - just yesterday, in fact - embarked upon my latest academic endeavour: the WSET (Wine and Spirit Education Trust) Diploma in Wines and Spirits. This blog entry will serve two purposes: one, a description of what is required for students on each day and; two, my reflection on each day as it passes. Firstly, what do you need to take with you? I'm writing this because the WSET sent me an almighty (and fear-inspiring) study pack, which weighs an impressive 10.8lb (that's 4.6kg). Regular readers will be in no way surprised that I weighed it as soon as it arrived. Faced with the prospect of commuting from Cambridge to London Bridge, hauling a learning pack which weighs almost as much as a fully grown border terrier, I started searching the internet to establish which bits were necessary and which I could leave at home, and drew a blank. I opted to bring just the book from 'Unit 2', which it turns out was the right decision (phew!). You will also need six tasting glasses which, mercifully, can be purchased from the WSET when you arrive. A pen and notepad are also advisable. The group was fairly large: 22 people, with a further two due to join us on day two. By and large they were industry professionals taking the course for career development, with a few very enthusiastic amateurs making up the rest. It was a relief to find that it was a group without egos ('wine folk' can occasionally be a touch over-bearing), and that all were keen to learn. The first day covered an induction, including what we can expect and, in turn, what is expected of us. I won't write about this here (I don't want to spoil the surprise for any of you, and it is already well covered on the WSET website). We later moved on to tasting technique which is subtly, but importantly, different to that employed in the WSET Advanced (now known as level three) standard approach to tasting. The tasting criteria are both wider and deeper in reach, aspiring to an altogether more detailed evaluation of the wines. I'll keep you updated with each day as we go, but for now I'm going to get on with studying grape-growing and wine-making procedures. Bye for now! You can read about Day Two here. Thanks for the comment Ena. Day two is tomorrow, and I'll write it up as soon as I get a chance. Will, hi, great blog! 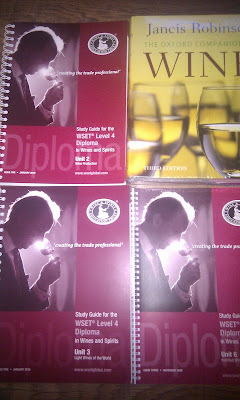 I'm due to start the WSET Diploma in London in October and wanted to see if you have any recommendations on reading ahead of starting? I'm just awaiting the course manuals but wanted to see if anything else you think is useful. Very good question. In fact, that's one thing a lot of people want to know. In truth, since the first unit you will sit is completely restricted to the information given in the handbook, I would recommend sticking exclusively to the other WSET publications (eg Level 3 text book). Using different sources can result in some contradictions and the WSET is at least internally consistent. The exam for the module is multiple choice, so exact wording becomes quite important. In short: before your materials arrive take another good look at the L3 text, paying particular attention to any weak areas you may have. Once the pack arrives get stuck into the Unit 2 handbook. There's a lot of it, and having read it BEFORE your lectures will make understanding it much easier. Hope this helps, and good luck with your studying!